One of our favorite traditions at Amazing Alterations is the wedding dress. We see hundreds of gorgeous gowns each year, and with each dress comes a happy bride. A beautiful dress for the bride is one of the most universal wedding traditions, though the style and color varies by culture and time period. For most of western wedding history, the wedding was a business transaction between the families of the bride and groom; the wedding gown was seen as a status symbol. Brides wore their finest dress rather than purchasing a new one for the wedding. It was uncommon to wear a black dress, as black was a symbol of death or mourning. It was also considered bad luck to wear a green dress on the wedding day. The white dress popular in western culture today has its most significant roots in the wedding of Queen Victoria to Prince Albert in 1840. Although there has been proof of white wedding dresses from as early as the 1400s, Queen Victoria’s wedding inspired a turning point in popular wedding style. According to Godey’s Lady’s Book, one of the first women’s magazines, white is the “emblem of purity and innocence of girlhood,” and was the most appropriate color to be married in. From the early- to mid-1900s, dress styles in America tended to fit with the popular dress fashion. From the 1960s to today, most styles have been based on traditional Victorian gowns. Though the tradition of wearing a white dress remains most common today, “wedding white” has expanded to include ivory and eggshell and many brides choose to be married in other colors. At Amazing Alterations, we have helped brides sticking to tradition with breathtaking white gowns and brides who choose to add their own twist to the tradition with stunning black, red, or blue dresses. We also work with brides wearing their traditional Eastern, African, or South American wedding attire! We love working with diverse dresses, and our expert seamstresses can handle any intricate task. 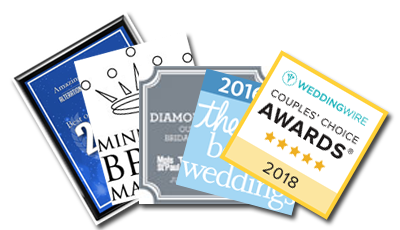 Whatever color or style dress you choose to be married in, Amazing Alterations is here to help you feel comfortable and confident on your wedding day. We can customize your dress to fit you and your vision perfectly. Call us today at 763-432-5243 or email us at appts@amazingalterations.com to set up a free consultation. Stay tuned to learn about the history of the wedding veil!